2006 bottle, rated Sep 2, 2007. My first barleywine so nothing to compare it to. A unique brew, quite complex...I may not be quite ready for this but here goes. Pours a dark amber, very murky. Tiny head that is gone in a blink of an eye. No lacing. Aroma of some fruit (pear), piney hops, caramel and some molasses. Flavor is quite strong, more hops, malt, caramel, molasses, some chocolate. Rather sweet. I'm sure there is more here, too. Initially was moderately carbonated, but as I get further into the glass, there is not really any carbonation left at all. Syrupy mouthfeel, but not quite chewy. You taste some alcohol, but it is not overbearing. There is a lot going on with this brew, and I will definitely have to try some other barleywines. 2010 bottled 12/30/2009, reviewed Feb 5, 2010. 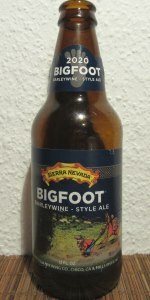 My first Bigfoot since my original review 2.5 years ago, although I've had a number of barleywines since then. Pours copper/red in a nonic with a large 3+ finger fluffy and rocky very light beige head which maintains a foamy cap and leaves clumps of sticky lacing. Sure doesn't look like a normal barleywine. Aroma is sweet, fruity, cherry, citrus and earthy hops, caramel malts. Flavor is predominantly sweet, cherry and other dark fruits, caramel malts, earthy resinous hops that bring some bitterness, also a bit of a Robitussin character, ahhh yes, the alcohol, you taste and smell it but it doesn't burn. Mouthfeel is full, rich, rather carbonated. The big foamy head threw me off at first, but I understand this is quite fresh, and will save most of these for a year or more. Even fresh, 2010 Bigfoot is very enjoyable, I'll have to enjoy at least one more soon.